In previous IMO posts we found that 2018 voting results in the Twin Cities metropolitan area helped propel Democratic candidates to win statewide races and state legislative seats, especially gaining in the fully developed suburbs. Turnout was high across the state, particularly with women and on the edge of Twin Cities developed suburbs, but comparably lagged in rural Outstate Minnesota. 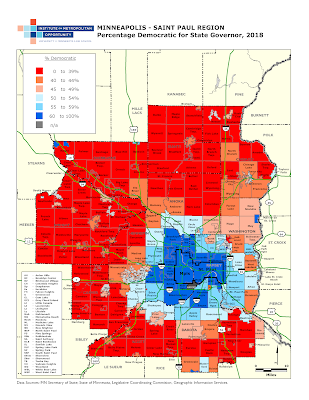 While hostility towards immigration and increasing diversity are among factors linked to election results, some of the largest increases in the Democratic vote occurred in racially diverse and semi-diverse suburbs in the Twin Cities metro, municipalities with populations between 10 to 30 percent non-white. In 2016, racial minorities make up 19% of the total population statewide. Minnesota’s population more typically lives in municipalities that are racially diverse, with racial minorities making up 15% to 29% of their populations. The chart below shows the total share of population broken out by percentage minorities in municipalities. 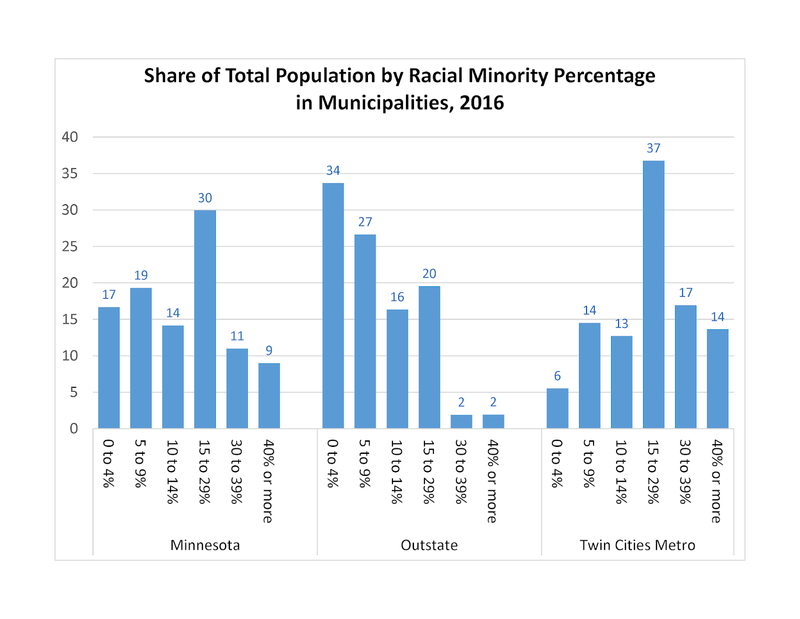 The left set of charts shows that statewide 30% of Minnesotans live in diverse municipalities, while only 17% live in more exclusively white municipalities that are less than 5% minority. There are clear difference between municipalities in the Twin Cities metro and Outstate Minnesota, with the metro having more racial diversity overall. 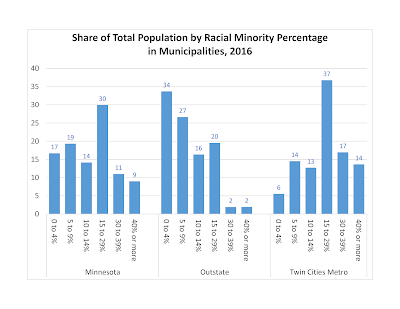 The middle set of charts below shows the population shares by minority percentage in municipalities for Outstate Minnesota and the right set shows these shares for the Twin Cities 11-county metro area. In the metro, 37% of residents live in diverse municipalities, while only 20% do outstate. 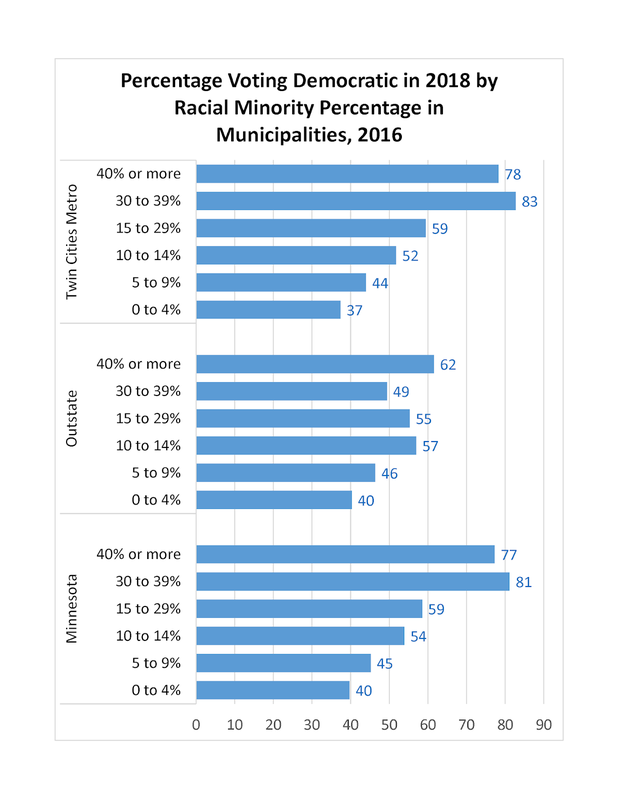 A greater difference between the metro and outstate is that the share of municipalities with 30% or more racial minority, is large in the metro (31%) and quite small outstate (4%). Racial diversity generally favors Democrats in elections. 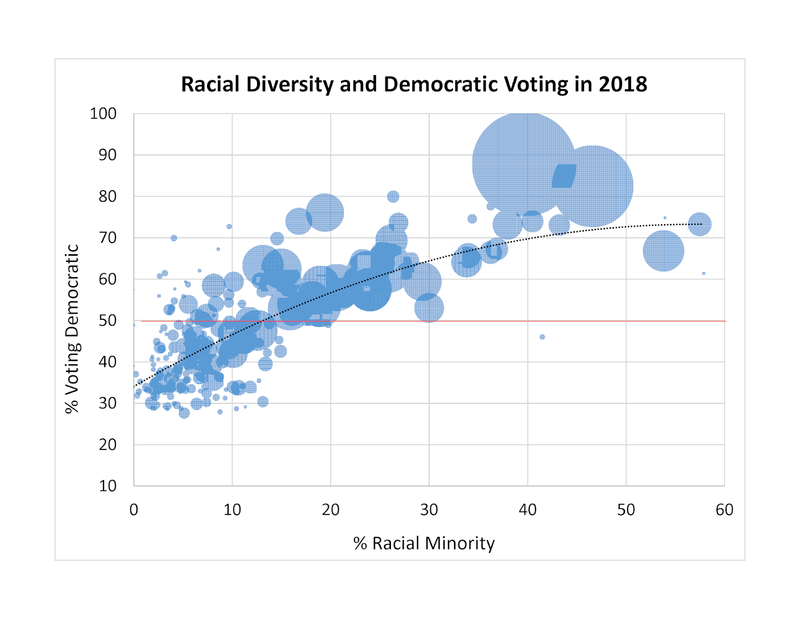 Typically, the larger the percentage of racial minorities that live in municipalities, the greater the percentage of voters that choose Democrats, as shown on the chart below for the 2018 Governor’s race. The chart shows this trend is pretty consistent statewide and in the metro, but is a little less apparent outstate. Although we report solely on the governor’s election, similar dynamics can be found in other 2018 election contests. 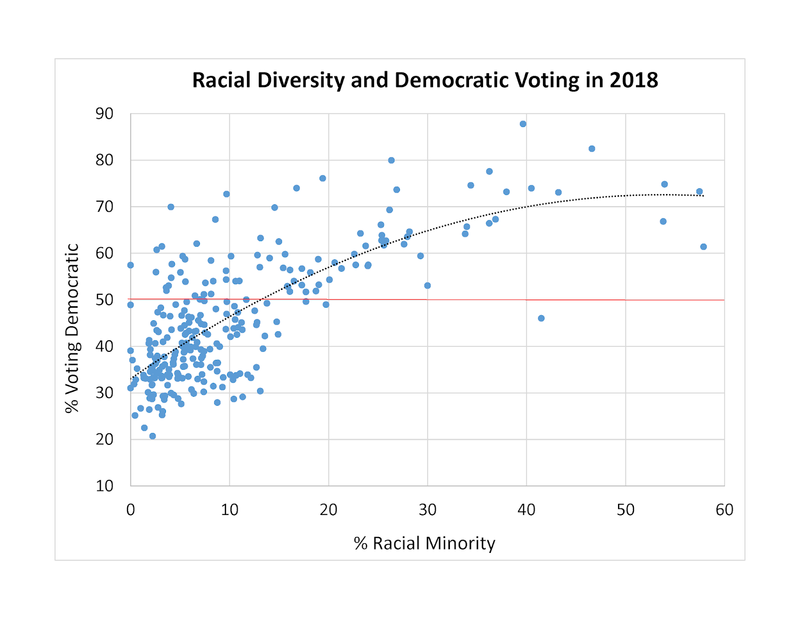 In Outstate Minnesota the Democratic vote shares in predominately white municipalities (< 15% minority) is actually slightly higher than in the metro, while the converse is true in more racially diverse municipalities, where the metro has much larger shares of the Democratic vote than outstate. In terms of the total vote, the fact that predominately white outstate locations tend to vote slightly more Democratic than similar metro locations is outweighed by the fact that these locations still less often vote Democratic and make up over three-quarters of the outstate population, compared to only one-third of the metro’s total population. Statewide, population percentage growth was moderate and relatively uniform across diverse and semi-diverse municipalities, but changes in population lagged or declined across predominately white municipalities. 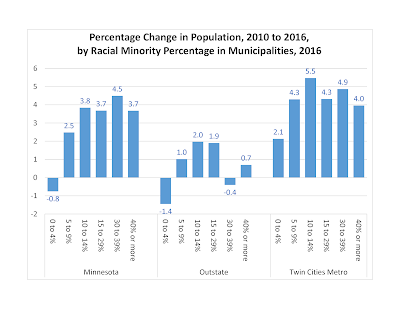 Furthermore, by far, growth was higher in the Twin Cities than it was in Outstate Minnesota, regardless of the racial composition of municipalities, as shown on the chart below. While population tended to grow slowly or decline outstate, and grow faster in the metro, racial minority shares in municipalities tended to grow more outstate than in the metro, as shown in the chart below. In Outstate Minnesota, municipalities with 30 to 39% minority had the highest increase in minority shares, a 5.0 percentage point increase, locations that tended to vote Republican (as shown on the 2nd to top chart), followed by municipalities with 40% or more minority, which had a 4.2 point increase. In these locations, the increase in minority shares is explained, in part, by lagging and declining white population change. In the Twin Cities metro, municipalities with 40% or more minority had the largest minority share increase of 3.4 points, followed by municipalities with 15 to 29% minority, with a 2.5 point increase. 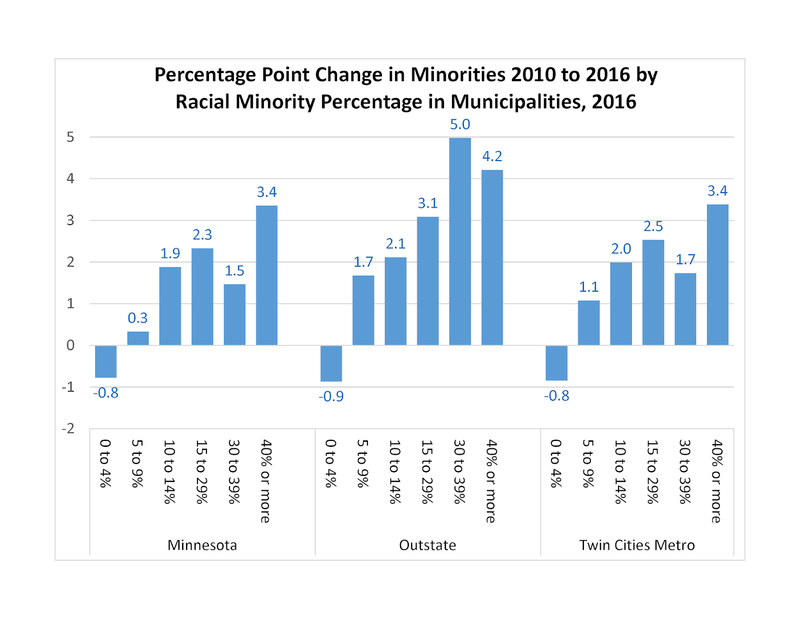 In the whitest municipalities with less than 5% minority, racial minority populations decreased statewide, outstate and in the Twin Cities metro. There are wide differences between the Twin Cities metro and Outstate Minnesota when it comes to changes in the Democrat vote in the 2010 and 2018 the gubernatorial elections. 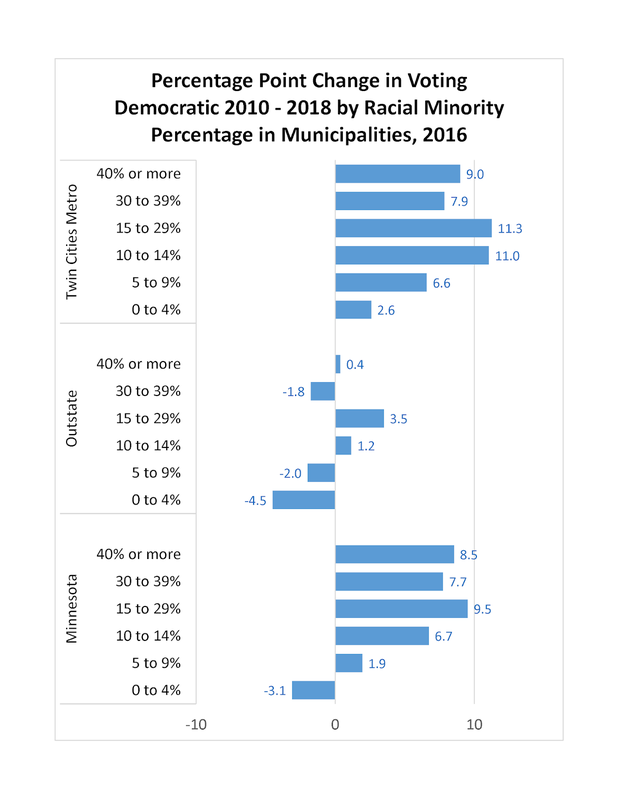 The metro area Democratic vote rose across municipalities, while in outstate it declined, except in municipalities 10 to 29% minority, as shown in the chart below. 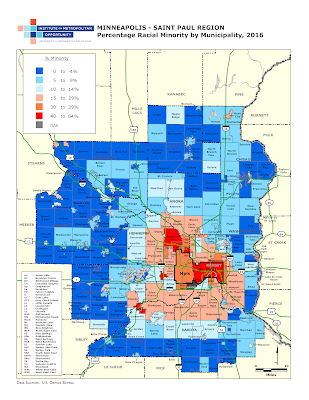 The greatest increase in the Democratic vote occurred in racially diverse and semi-diverse Twin Cities’ suburbs (10 to 29% minority), with around an 11 point increase in the share of the Democratic vote for Governor. The greatest decrease in the Democratic vote occurred in the whitest outstate municipalities, with less than 5% minority, where the Democratic vote for Governor dropped 4.5 points. The Twin Cities metro is growing, has increasing diversity and the largest share of racially diverse suburbs, and has the largest swing in the Democratic vote in the state. As shown on the map below, the central cities and first-ring suburbs voted strongly for Democrat Tim Walz, who captured over 60% of the (two-party) vote in these areas, as well as in a few second ring suburbs, including Bloomington, Eagan and Minnetonka. Walz also won almost all second ring suburbs and about half of the third ring suburbs, but did less well in outer ring suburbs and exurban (rural) municipalities, as did most democratic candidates. Much of the outer bands of suburbs captured by Walz are racially diverse and have had recent growth in both population and racial minorities, as is shown by comparing the two maps below and charts above. Both the cities of Minneapolis and Saint Paul, as well as several inner ring suburbs have even greater racial diversity, while beyond the third ring of suburbs, municipalities are predominately white, and largely undeveloped. The relationship between metro area racial diversity and democratic voting is better illustrated by a graph. 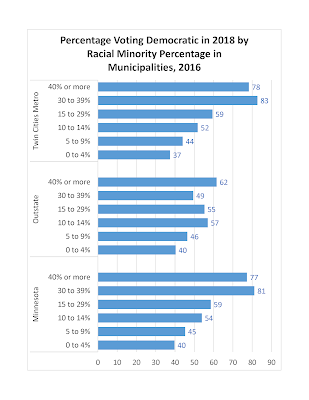 It is clear that there is a strong positive correlation between the percentage minority and the percentage voting Democratic in municipalities, as shown on the chart below. As the percentage of racial minorities rises across municipalities, so does the percentage voting democratic in the 2018 gubernatorial election, in a curvilinear fashion. According to this model, a municipality typically starts voting Democratic when it has a population that is 13% minority. One misleading feature of the chart below is that it does not account for the voting population size of municipalities. When doing so, it is clear that the Twin Cities is even more Democratic than might first appear, as most of the larger suburbs, including the cities of Minneapolis and Saint Paul, fall above 50% Democratic voting line. How much more the Twin Cities metro has become Democratic can be seen below in the animated map of percentage voting Democratic. In the last five election races, either presidential or gubernatorial, the area that Democratic candidates have won has, for the most part, consecutively expanded across metropolitan space. In 2010, Democratic Governor Dayton’s strongest support (>=60% of vote) came mainly from the central cities and a handful of first-ring suburbs, winning few of the second ring suburbs, while in 2018, Democratic Governor Walz, had moderate to strong support in most second ring suburbs, locations that Dayton largely lost in 2010. 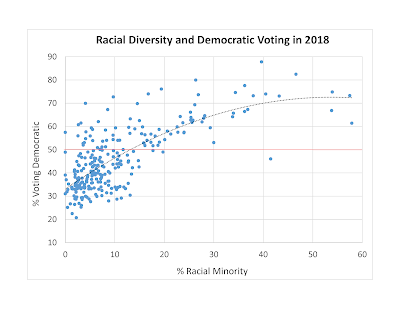 There is also a consistent positive correlation between metro area racial diversity and democratic voting across the five elections, with some fluctuation of the overall share voting Democratic and discrepancy when the typical municipality begins to start voting Democratic. All elections were won by Democrats, at varying margins of victory. In 2010 Governor Dayton won by somewhat smaller margins in the metro, and he tended to win in a municipality when it was 29% or more minority. In the next election, Obama gained an even greater share of the vote, typically winning municipalities with 14% or more minority. 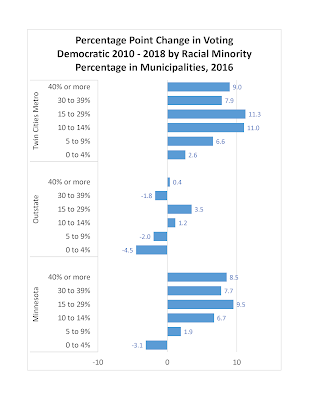 In 2014 and 2016 the Democratic municipal win margins and the minority win shares both dropped and it became harder for a Democrat to win in municipalities with under 20% minority. And up to the present election, Governor Walz typically won municipalities with 13% or more minority (and won all but one municipality with over 20% minority).